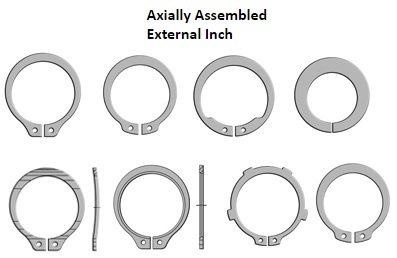 TAPERED SECTION EXTERNAL RETAINING RINGS-AXIALLY ASSEMBLED | Cal Fasteners, Inc. These are for Installation in Housings and Shafts and have a “tapered-section.” When you compress the lugs to install the ring in a housing (or expand them to install over a shaft), the height of the ring decreases symmetrically from the top to the free ends. This construction makes it possible for the rings to exhibit a circular shape when released in the groove, which allows the ring to grip the bottom of the groove tightly along the ring’s entire edge. This feature provides high thrust load capacity. Tapered section retaining rings grip the entire periphery of the groove along the ring’s edge offering high thrust load capacity.